So what is this undercover agent? Squash. Finely grated, yellow summer squash to be exact. As you know I am always trying to get my meat eater to have more veggies. 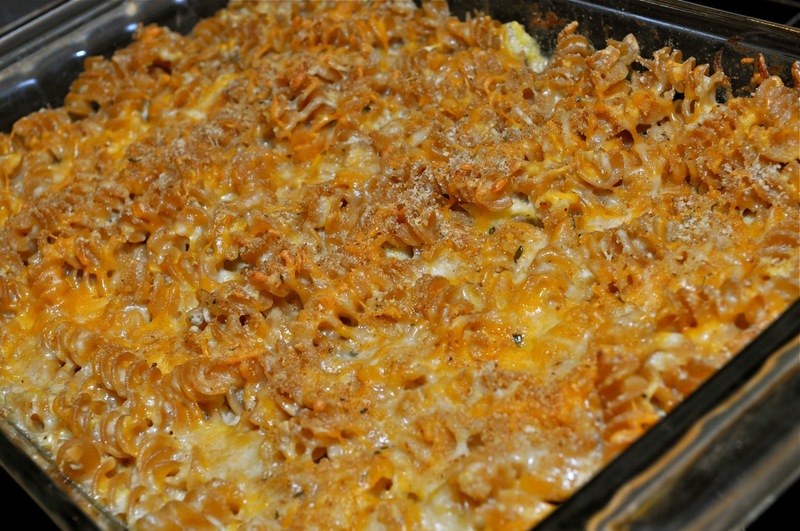 And what better way to hide them than coated in cheese and baked in pasta? Hey, don't knock it. At least he is getting the wonderful benefits of squash (like vitamins A, C, beta carotene, and iron). Combine that with his recent switch to whole grain pasta and its at least a semi-healthy side dish. First finely grate the squash. Place it in a colander in the sink and let any excess liquid drain. Then, boil a large pot of water with salt. Cook pasta til almost al dente (remember it will get a second cooking in the oven). Preheat the oven to 400 degrees. In a large sauce pan, heat the milk and bay leaf over a low flame. Do not boil or scold. In the meantime, melt the butter in a small pan. Add in the flour until well combined. Remove the bay leaf from the milk and add in the butter mixture. Whisk til smooth. Add all but 2 tblsp of the cheese and melt completely. Stir in the squash. Flavor with nutmeg, salt and pepper. Simmer and thicken til pasta is ready and drained. 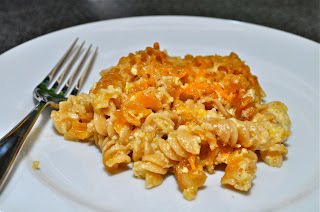 Return pasta to the pot and coat with cheese mixture. Place the cheesy pasta in an oven proof dish. 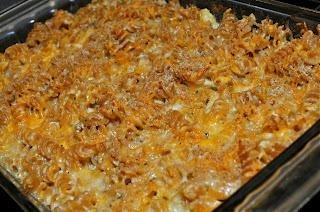 Dust with more shredded cheese and breadcrumbs. Bake for twenty minutes, until bubbly. Let stand for five minutes before serving. I made this for dinner last night, YUM! My husband didn't even complain that he was eating veggies! You have inspired me to sign up for my local CSA. Thanks for all of your great information and wonderful recipes! That is great news - both about your husband and the CSA! So glad you liked it. I'll keep the CSA recipes coming! Mmm I love squash, but I have a hard time finding recipes Jonathan will eat. I bet he'll gobble this one up! My carnivore has eaten this for years without noticing the squash. Hope it works for y'all too! Thank you for sharing this. Makes me think of my Dad with coconut. He was eating cookies that had it in it. He must of had 6 when someone broke the news and would not touch them again. Aren't guys funny?! Glad you found the blog! Do you mean a 12oz box of pasta? That's what I have. Seems like a lot.